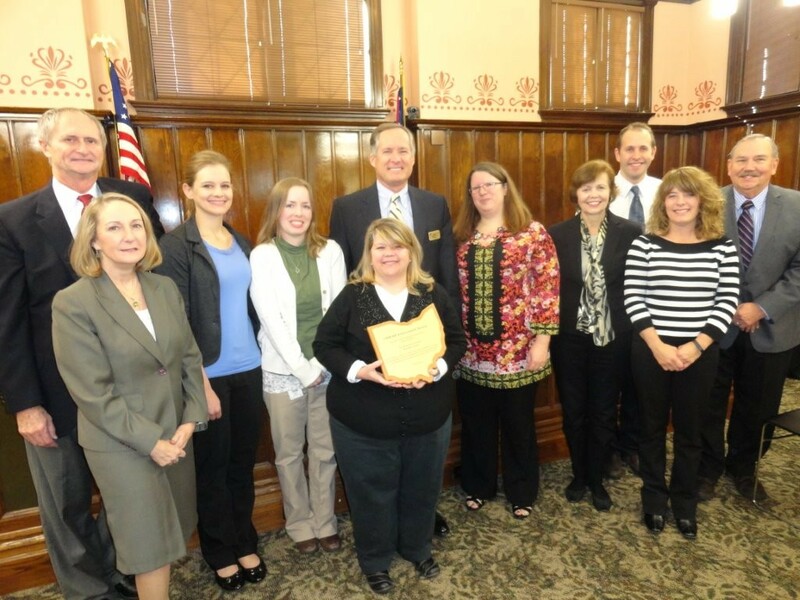 Delaware County Records Center Coordinator Christine Shaw (holding plaque) and her staff received the 2015 Achievement Award from the Ohio Historical Records Advisory Board during the county commission meeting on November 16, 2015. Pictured from left to right, County Prosecutor Carol O’Brien, Commissioner Gary Merrell, Records Technician Alison Miller, Records Technician Megan Henry, Commissioner Jeff Benton, Ohio Historical Records Advisory Board member Pari Swift, Commissioner Barb Lewis, Ohio Historical Records Advisory Board member Stephen Badenhop, Records Technician Sharrie Doubikin and County Auditor George Kaitsa. The Delaware County Records Center:, for its devotion to the care, preservation, and accessibility of county records through continual modernization of processes and dedication to providing convenient public access to the records in its care. The Kelleys Island Historical Association: for its efforts in implementing archival accession, processing, and cataloging procedures; increasing the accessibility of its collections through the creation and publishing of its inventory; and fostering research through new initiatives.